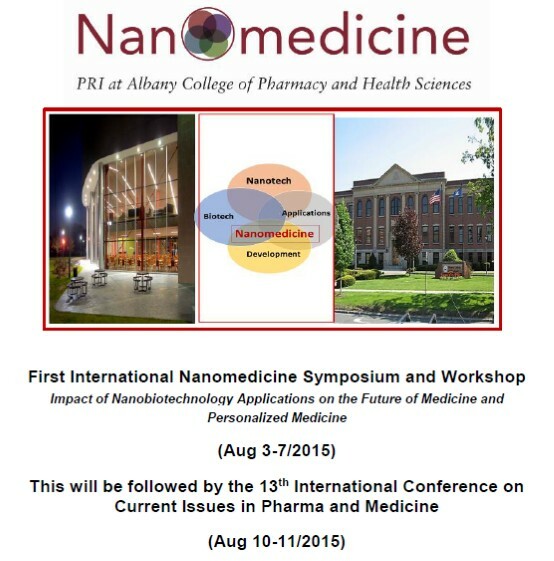 It is our great pleasure to invite you and members of your organization to the First International Nanomedicine Symposium and Workshop: Impact of Nanobiotechnology Applications on the Future of Medicine and Personalized Medicine from August 3-7, 2015 to be held at Albany College of Pharmacy and Health Sciences in Albany, New York. This Nanomedicine lecture and workshop series will provide cross-cutting topics that will prepare individuals from biological and physical sciences, engineering, pharmacy, medicine, and healthcare-related professional disciplines to become familiar with current Nanomedicine research and applications. It will be presented by national and international experts from academia, biotechnology and pharmaceutical industries, federal research, and regulatory institutions, National Institute of Health (NCI Nano Lab), and the Food and Drug Administration. The symposium will be followed by the 13th International Conference on Current Issues in Pharma and Medicine from August 10-11, 2015, also to be held at Albany College of Pharmacy and Health Sciences in Albany, New York. If you have any questions or need further information, please do not hesitate to contact my assistant, Laura Stellato, by email (laura.stellato@acphs.edu) or by telephone (518-694-7575).